Angry? “No, not me. I’m not an angry sort of person.” Actually, I suspect very few of us are. So allow me to share a story. Bob had been gone for some days, and couldn’t wait to see his wife again. On the ride home from the airport, he could already hear her enthusiastic hello, relish her eagerness to hear all about his experiences, taste the tea and favorite bit of baking she’d prepared for him. He hopped out the car, dashed up the front steps, pushed open the door and hollered eagerly, “Lauren, I’m home!” Silence. He walked down the hall, looked around the corner, and there she was, ticking away on her laptop. Enthusiastically: “Hi, Lauren! I’m back!” Response: a mild, “Oh, hi, Bob” and her fingers kept tapping the keys…. Bob could blow his stack and let Lauren know in no uncertain terms that this is no way to welcome your husband home. When a good buddy phones to welcome him back, he could let on that he feels badly hurt by his wife’s coldness. He could even suggest to his buddy that he try to get his wife to have a chat with Lauren and make clear that her behavior just isn’t acceptable. Loosing it, righteous instruction, sulking, slander, manipulation: which response is acceptable? For that matter: is there a common denominator under all five? I didn’t make the above story up. I actually heard it at a recent conference hosted by the Christian Counseling Center. Robert Jones came up to Ontario from the Carolinas to talk about Anger, and somewhere in his presentation he told the story. We were asked to consider where the problem was in relation to Bob. Was he justified in giving Lauren a piece of his mind? Was he right to tell her what the Bible says about how she ought to welcome her husband? Was he justified in retreating within himself? Or sharing his hurt with another, let alone gently manipulating another to set Lauren straight? The thing is, of course, that each of us can relate quite well to every aspect of Bob’s response. That’s because anger is much at home in the heart of every sinner…. I’ll admit that when I entered the doors of the conference building, I tended to define the term ‘anger’ as a burst of outrage, be it slamming the door, pounding the table, shouting, and the like. But our speaker made clear that that was far too limited an understanding. The rage and the slamming and the pounding and the shouting are in fact expressions of an irritation rooted deep within the heart. That irritation is awakened by events (or words) that strike you as unfair or wrong or insensitive, etc. You can give expression to that irritation in various ways, be it blowing your stack or retreating within yourself or slandering the perceived wrongdoer to your friend or manipulating a third party to influence the wrongdoer, etc, etc. Anger is, Biblically speaking, not first an action, but is instead an attitude of the heart. Anger is, Biblically speaking, not first an action, but is instead an attitude of the heart. Some bump in the road, some irritation, say, will cause the anger inside to express itself in some particular action – including Bob’s various responses as outlined above. All are expressions of inner anger. And since inner anger is wrong, all these expressions of anger are wrong. I was surprised to learn that the gospels record three incidents –yes, only three!– when Jesus became angry. That’s when Jesus healed the man with the shriveled arm (Mark 3:1-6), received the little children (Mark 10:13-16) and overturned the tables of the moneychangers in the temple (John 2:13-17). We’d fully expect Him to become angry when they sought to stone Him, or when they associated Him with Beelzebub, or when they ridiculed Him. We’d expect Him to be angry when He was arrested, mocked, spit upon, and crucified. But there’s nothing of the sort in His reactions. The Scriptures tell us that He went like a lamb to the slaughter. As to the instances when He did become angry: in each instance God’s name was blasphemed through the hardness of human hearts, and that’s what triggered anger on Jesus’ part. His anger, then, was in tune with God’s holiness and in step with God’s own anger against sin. Never did the man Jesus become angry in response to feeling slighted or being sinned against. That’s highly instructive, given that the child of God is meant to imitate Christ Jesus (cf Ephesians 5:1). So where’s the wrong in Bob’s situation? Could Bob rightly point a finger at his wife and insist the wrong lay fully and only with her? Could he plead that his response was a justifiable and righteous response to her failure? Our speaker asked us to consider Mark 10:45, “For even the Son of Man came not to be served but to serve, and to give his life as a ransom for many.” Here is the driving thought behind Jesus’ conduct in life, and this is to be the driving thought in the lives of all His people. Application for Bob: he let his thoughts on his way home be self-centered, and so expected his wife to be there for him. Since she didn’t satisfy his expectation, he became angry, and that anger received expression in, well, any of the options listed above. Had Bob, on the other hand, approached home seeking not to be served but to serve his wife, he would have been in the right frame of mind to reach out to her and perhaps support her in some burden unknown to him. Such a mindset would reflect the Lord Jesus Christ. But, we protest, we can’t always give! Our speaker did an excellent job of drawing out that we in fact have all we need in Jesus Christ. He mentioned 2 Peter 1: “His divine power has granted to us all things that pertain to life and godliness” (vs 3), and asked us to contemplate the force of the word ‘all’. In Christ we actually have all things that we require for this life! We say: but I need that kiss, that show of affection, that attention, that promotion, that…. And when we don’t get it we get annoyed, exasperated, frustrated, irritated – all expressions of anger…. 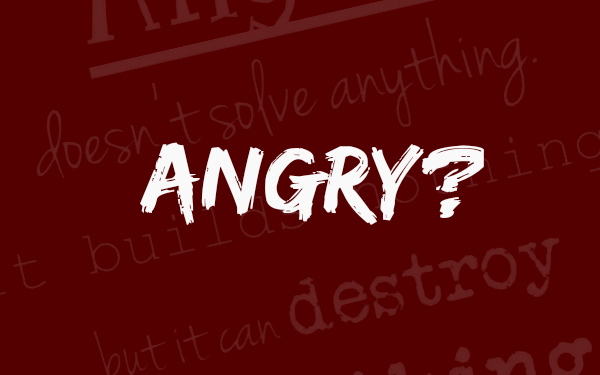 In the anger is an implicit criticism of God; He’s not truly giving us what we need. Paul responded differently. He wrote his letter to the Philippians while he was imprisoned (perhaps in Rome). But from his cell he wrote: “Not that I am speaking of being in need, for I have learned in whatever situation I am to be content” (4:11). “In whatever situation”?? Yes, he says yes. “I know how to be brought low and I know how to abound. In any and every circumstance, I heave learned the secret of facing plenty and hunger, abundance and need” (vs 12). What the secret is?? “I can do all things through him who strengthens me” (vs 13). So he tells the Philippians: “My God will supply every need of yours according to his riches in glory in Christ Jesus” (vs 19). Note the word “every need”. Irritated at a slight? Upset at a knockback? Peeved because he didn’t get do what you thought he should? Livid at a demotion? Anger will never do, because Jesus Christ gives me all I really need. The question is: do I believe that? Or do I in fact believe that I actually need people’s approval, because, well, the Lord, you know, actually disappoints…. One little tangent before I sum it up…. The thought is alive and well in our North American culture that we’re entitled to happiness, satisfaction, accolades, etc – and actually entitled to our definition of happiness, satisfaction, etc. Because North Americans are not getting what we think we deserve we end up with more and more frustrated and angry people across our continent. But that has enormous –and very devastating– social consequences. Behind marriage failure is the anger (or irritation or frustration or mention what parallel word you would) that results from not getting what we think the spouse should give us. Behind the mass shootings we hear about is again so much anger on account of perceived slights. Etcetera. I’m afraid we’ll see more of it. But the Christian may not think in terms of entitlement. If anyone had an entitlement, it was the Lord Jesus Christ. But He did not cling to His divine glory, nor insist on what was His. He gave it all away, to redeem the undeserving. That’s the Christian’s example. As Jesus Christ did not come to be served but to serve, so the Christian does not think in terms of being served, but thinks in terms of how he can serve the other. That fight against selfishness will put a huge dent in the anger that stays too close to our hearts. And our culture needs guidance and encouragement in that fight. That’s the task (in part) of the Christian. I’m grateful for the work done by Christian Counseling Center. It’s good to be reminded that anger (be it quiet or loud) is actually an ungodly response to what the Lord puts on our path. With the exception of “righteous anger” –where one is angry because God has been blasphemed– anger is in fact sin, and so it needs repentance and then resistance. Here’s ongoing work for us all. Note: Robert Jones’ book on the topic, entitled Uprooting Anger, published by P & R Publishing, is available in Christian bookstores or from Amazon.